We continue to see media blurbs and ads for both Microsoft's Windows NT and IBM's OS/2. Both promise to be the oprating system that we need and to take advantage of the Intel 386 and beyond. 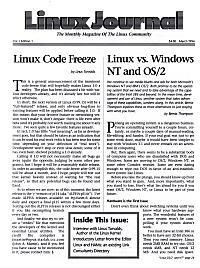 The interview with Linux Torvalds, the author of the system kernel of Linux. His thoughts and ideas of Linux past, present and future are truly far reaching. We continue to see database applications being developed in fourth generation languages (4GLs), and we continue to seemore and more sophisticated (and expensive) 4GLs.